Angela Topping is a poet and took up a residency at Gladstone’s Library in October 2013. Angela is the author of 10 solo poetry collections and pamphlets, published by Stride, Bluechrome, Salt and Rack Press. She is a full time freelance poet as well as writing reviews, and criticism for Greenwich Exchange. Angela is also an experienced teacher and holds Masters Degrees in English Literature and in Arts in Education. She leads workshops with young people to the elderly, with an aim to build confidence in their own ability to write and tell stories. Two of her books are for children and she has co-authored three books on poetry at GCSE level for OUP. Her poems have also been set for A-level and have appeared in a range of magazines including Poetry Review, London Magazine, Agenda, The Interpreters House and others. She was Highly Commended in the Cheshire High Sherriff’s Prize for Children’s Literature, and in 2011, she was shortlisted for The Bridport Poetry Competition. In 2013, she won first prize in the Buzzwords Poetry Competition, judged by David Morley. "Gladstone’s Library is a home from home. Silence in the library fosters writing; chat over dinner fosters friendships. I gained a great deal from my residency and am often drawn back to this special place." Katrina Naomi was a writer in residence at Gladstone’s Library in 2013. Katrina is a poet, tutor and poetry mentor. Her poetry has appeared in The TLS, The Poetry Review and The Spectator as well as on BBC Radio 4. Katrina’s first full collection The Girl with the Cactus Handshake was shortlisted for the London New Poetry Award and received an Arts Council England writer’s award. Her pamphlet Charlotte Bronte's Corset was published by the Bronte Society, and written during Katrina’s time spent as the Bronte Parsonage Museum's first Writer in Residence. Her pamphlet Lunch at the Elephant & Castle won the 2008 Templar Poetry Competition. Moreover, her most recent pamphlet, Hooligans, was inspired by the Suffragettes and was launched by Rack Press in London this February. She received a PhD in Creative Writing from Goldsmiths in 2014 and an award from the Royal Literary Fund. She was a 2015 Hawthornden Fellow. "I always tell my mentees to read, read, read. And I had this opportunity here and I took it. I loved the research I was able to do and I loved the library. And I wrote a hell of a lot, far more than I expected to. I'd gone to research the lives of several Suffragettes but I ended up doing all of that and writing enough poems to form the pamphlet Hooligans, based on this research, which went on to be published by Rack Press in 2015." Peter Jukes is a British screenwriter and journalist. Through his TV appearances and regular columns on the Daily Beast website and in Newsweek, he has become one of the UK’s most authoritative commentators on the News International phone hacking scandal and the Leveson inquiry. Prior to that he wrote regularly on the links between culture and politics for the Independent, New Statesman and Prospect magazine, and as a high-profile contributor to US political blogs. He is also an award winning dramatist for stage, radio and television, whose credits include Matador, In Deep, Bad Faith, Waking the Dead, The Inspector Lynley Mysteries and Sea of Souls. His account of living in the modern city, A Shout in the Street (Faber & Faber, 1990) was called ‘a dream of a book’ by John Berger. He lives in London. Richard Beard has published five novels including X 20 A Novel of (not) Smoking, Dry Bones and Damascus, which was a New York Times Notable Book of the Year. In 2008 he was shortlisted for the BBC National Short Story Award and in 2010 longlisted for the Sunday Times EFG Private Bank Short Story Award. His latest novel is Lazarus is Dead (2011). Richard Beard is Director of The National Academy of Writing. "My one concern was that I knew very little about William Gladstone. Fortunately, there’s no test on Victorian politics when applying!" 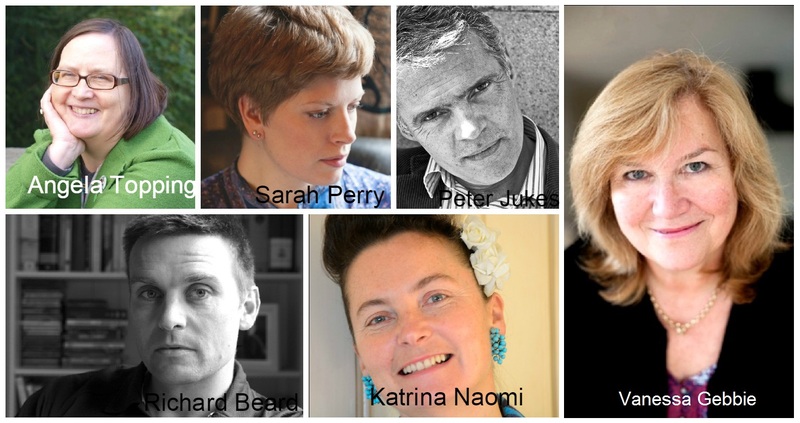 A winner of the Shiva Naipaul Memorial Prize, Sarah Perry holds a PhD in Creative Writing from Royal Holloway University, for which she was awarded an English Doctoral Studentship and studied under the supervision of Sir Andrew Motion. Her short fiction was published in the anthology Bedford Square 2 in 2006, and she has written on food, law and the arts for a number of publications including the Spectator. Her first novel After Me Comes the Flood, published in 2014 by Serpent’s Tail, won the East Anglian Book of the Year award 2014 and was longlisted for the Guardian First Book Award 2014 and the Folio Prize 2015. Her second novel, The Essex Serpent, was published in July 2016. Vanessa Gebbie is a novelist, short fiction writer, editor, teacher and poet. She is contributing editor of Short Circuit, Guide to the Art of the Short Story, editions 1 and 2 (Salt). Her short fiction collections are Words from a Glass Bubble and Storm Warning (both Salt), Ed’s Wife and Other Creatures (Liquorice Fish) and A Short History of Synchronised Breathing (forthcoming, Cultured Llama). Her novel The Coward’s Tale (Bloomsbury) was a Financial Times novel of the year. She has won awards for both fiction and poetry, including a Bridport Prize and the Troubadour Prize, and her poetry pamphlet The Half-life of Fathers (Pighog) was selected by the Times Literary Supplement among the best of 2014. Her latest poetry collection, Memorandum, Poems for the Fallen, is the inspiration for a four-woman exhibition touring Sussex churches, commemorating the centenary of the Battle of the Somme in painted glass, letter-cutting, photography and words.